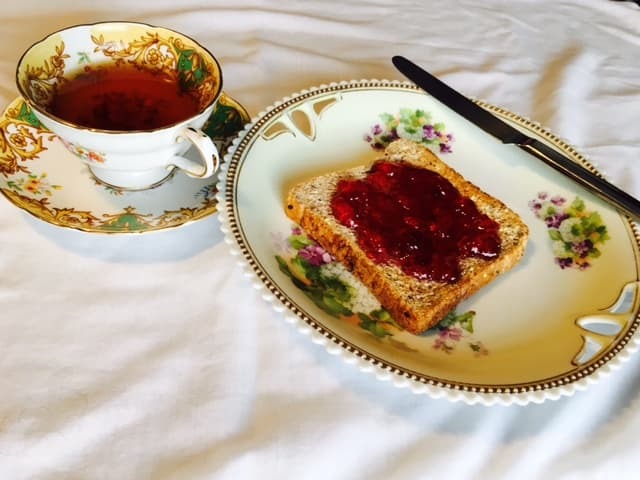 Is it any surprise that some older adults love their toast and tea? It's easy and inexpensive. It gets the job done. But when it comes to aging well, it turns out that falling back on this combo day after day could have some very serious drawbacks. In some regions, one in three seniors is at risk of undernutrition — insufficient intake of food for maintaining good health. A piece of toast with jam might not seem like a big deal, but if it's not part of a diverse diet, it could put a senior at risk for health problems. The data are clear: poor nutrition in older age can lead to weakness, falls, and susceptibility to illness, or even movement to a hospital or care facility. A hot area of science—study of the microbiome—is strengthening the links between nutrition and health in older age. With age comes a progressive loss of muscle and an increase in fat, even if a person's body weight remains constant. In addition, older adults experience changes in how they metabolize nutrients. Shifts in the gut microbiota composition (the collection of bacterial species living in the gut) occur in parallel: from at least age 75, scientists have found, the gut microbiota changes gradually over time. The gut microbiota changes don’t seem to be inevitable: some older individuals break the pattern. A study of people who live a very long time—semi-supercentenarians between 105 and 109 years old—showed these individuals differ from their peers by having higher levels of health-associated bacteria in their digestive tracts. This means it’s not just age that can determine gut microbiota composition. Scientists think the process of aging itself probably doesn’t influence microbiota composition as much as the lifestyle changes that often occur with age. The lifestyle factor that seems to have the strongest influence in the golden years? Diet. Studies show dietary fibre and certain kinds of prebiotics can modulate the gut bacteria of seniors for the better, and some probiotics (species of lactobacilli and bifidobacteria) can change the microbiota composition in ways that specifically benefit health. Studies show probiotics can inhibit pathogens and positively modulate the immune system, even boosting vaccine responses in some cases. Researchers have also found that when an elderly person moves to a long-term care facility, there is an almost immediate change in their gut microbiota; they think these changes happen because of the dietary shift to institutional, rather than home-cooked, food. So when it comes to changing the microbiome, lifestyle (and especially diet) seems to trump chronological age. It’s true that we still don’t know for sure whether microbiome changes are the impetus for better or worse health, but as scientists make more and more of these connections, it seems wise to implement the lifestyle changes that foster a diverse gut microbiota with lots of beneficial species. That includes proper nutrition over the age of 65—a varied diet with ample sources of fibre and protein, and perhaps even live microorganisms. Eating well can pose more of a challenge as the years go by, but its role in maintaining function and vitality in older age might be more profound than anyone imagined. As far as the gut bugs are concerned, toast and tea just won’t cut it.